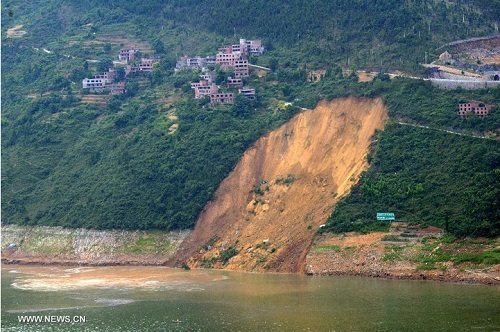 China – A massive landslide on the northern bank of the Daning River in Wushan County of Chongqing Municipality, southwest China has left one missing and injured four others. Vietnam – Flash floods triggered by a tropical storm Kujira have killed seven people and left four others missing in a northern Vietnamese province. Flash floods washed away more than 20 houses in the province. Tropical Storm Kujira which slammed northern coast on Wednesday has now dissipated, according to the national weather forecasters. The storm has dumped up to 20 centimetres (nearly 8 inches) of rain on many parts of northern region over the past two days. Philippines – Three people were confirmed dead as overnight heavy rains in South Cotabato province caused rivers to swell, causing flash floods and landslides, reports said. Authorities estimate that at least 10,000 people had been affected by the flooding. The flood waters have reached as high as 1.5 metres in some areas.